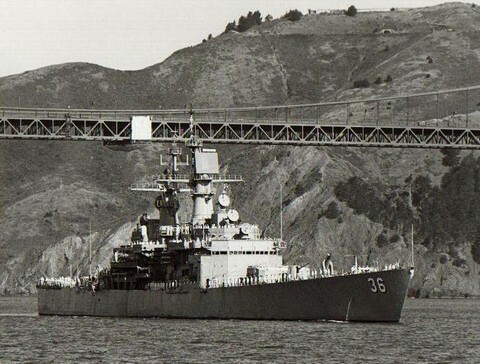 The USS CALIFORNIA (CGN-36), a California class nuclear powered cruiser, was commissioned on 16 FEB 1974. USS CALIFORNIA initially served with the Atlantic fleet after commissioning. Her first crossing of the Atlantic was for the 25th anniversary of Queen Elizabeth II assuming the throne of England. CALIFORNIA's following "MED" deployments had a destination of the Indian Ocean due to the Iranian Hostage Crisis. The second of these concluded as an around the world cruise. With a change of homeport to Alameda, CA in 1983, CALIFORNIA's deployments took her to the Western Pacific and, often, back to the Indian Ocean. USS CALIFORNIA served her country for 25 years, 4 months and 23 days, until decommissioned on 9 JUL 1999. The hulk of the CALIFORNIA was processing by the Nuclear-Powered Ship-Submarine Recycling Facility at Puget Sound Naval Shipyard was completed in May 2000.